Published! ;-) | Flickr - Photo Sharing! Eight of my night shots have been published in the April 2008 edition of Digital Photographer magazine Ukrainian edition (David, help for the translation!) in a special feature about night photography. My first publication ever in a specialized photo magazine. 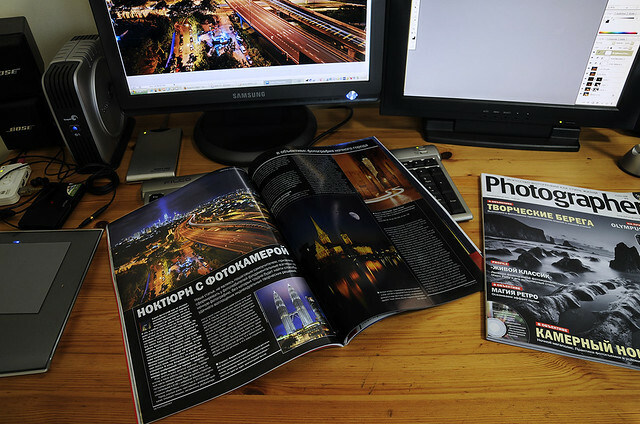 Thanks to the chief editor Evgeniy Zubenko for selecting my photos. Also a special thank to my Kuala Lumpur buddies Vedd, Ariffin for taking me to the best vantage points in KL, specially the one which is shown here on the magazine. This shot is also the opportunity for you to see my workstation on which I spend way too much time! On the right screen, you can see the Photoshop screen and the 9 layers used to create the The Veins of Kuala Lumpur digital blended shot. Kelvin Wong (Away), E. Chan, and 35 other people added this photo to their favorites. HUGE, congrats Daniel. Very well deserved! Congrats dude...your work is top notch as always. WoW, congratulations and well deserved !!!!!! Congratulations and may I wish you even more success in the future.